Movement in masonry structures may occur for a variety of reasons. The result is often cracking at the weakest points. Strength may be restored by the installation of masonry reinforcement. Masonry reinforcement consists of deformed stainless steel bar or helical stainless steel wire which is set into epoxy or cementitious grout. The helical wire is generally used in brickwork repair and may be 6mm or 8mm in diameter. 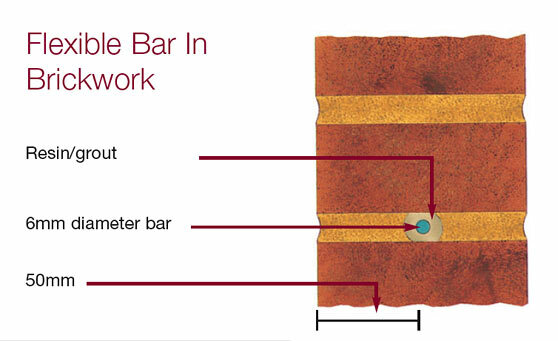 Solid deformed bar is available from 6mm diameter upwards for more major repairs. The reinforcement may be installed in short lengths to stitch across cracks, or may be used in continuous lengths to form virtual “beams” in the brickwork. It is important to ensure that there is sufficient bond of the reinforcement into stable sections of the structure. In order to preserve the aesthetic appearance of the building Falcon pay particular attention to making good the surface of the brickwork, pointing or render to match as closely as possible to the surrounding surfaces. Whatever your structural defects, please contact our local office for a competitive estimate on domestic, commercial or industrial projects.